If you are insecure about your ears then you probably don’t want them being on display when you look at your beautiful wedding pictures. There are many hairstyles that can help cover your ears so that you don’t have any insecurities and you feel completely confident on your wedding day. 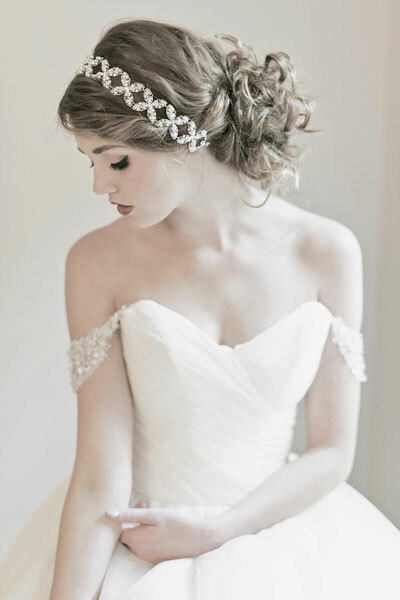 This simple yet classic look is great for a wedding; it keeps hair off your neck but still covers prominent ears. There are many ways to incorporate a braided crown with a bun, and it is up to personal preference but one way to keep your ears covered with this hairstyle is to keep it loose. A simple one-sided braid that flows into a loose braided bun is flirty and feminine and keeps those ears covered up. This braided crown hairstyle is trendy and a chic way to cover your ears. 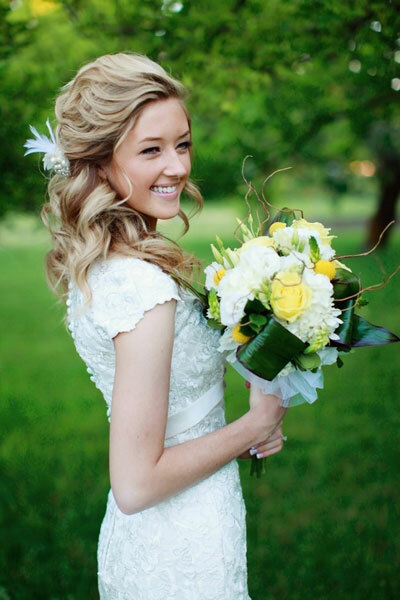 Nothing covers ears better than curls and they are also a wedding-style hairstyle favorite. After you have your hair curled in big bouncy curls, sweep all that hair to one side and pin using bobby pins. Make sure you keep the sweep low so that the side that doesn’t have the curls is still covered. You can also leave some loose strands on that side to create balance and cover your exposed ear. 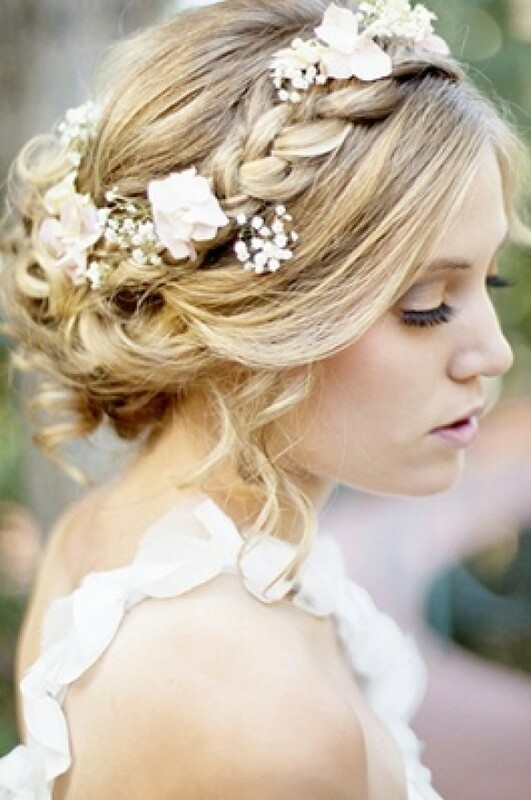 This gorgeous side-swept hairstyle is perfect for a wedding. Completing your hair with a stunning headband is an easy way to make your simple hairstyle really impress your guest and groom. You can wear your hair curled, straight, or loose waves and simply pull it back in a low chignon and accessorize with a headband. Wearing your hair down for your wedding day is one of the easiest ways to cover your ears. You might think that up dos are more glamorous for your wedding hair, but there are many gorgeous down hairstyles that are tremendously flattering. Vintage hairstyles are “IN” right now, and for obvious reasons. Their elegance and classic look compliments every dress design and give your wedding hair a timeless look. For this look simply give yourself volume around the crown and add loose retro pin curls throughout your hair. Give your bangs extra volume in the front while sweeping your hair to one side. These vintage curls with flower accessory are classic beauty. Not-so-perfectly coiled loose waves worn down are elegant and look fantastic with classic veils. If you have medium to long locks and want to cover your ears then loose waves with a side part is a fabulous choice. These loose waves will work on any length and cover your ears effortlessly. You might discover that the half up – half down hair do is the perfect answer to your ear dilemma if you still want to wear your hair up but have concerns about ear exposure. The key to keeping your ears covered with your wedding hairstyle is to have curls, volume, and your hair loosely pulled back so it naturally covers your ears. 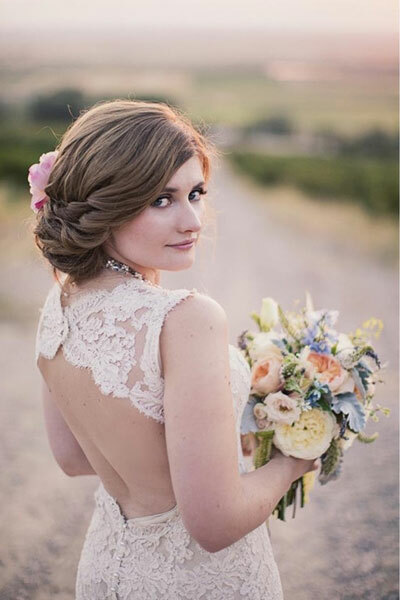 Simply curl your hair as loose or as tight as you prefer, loosely pull your hair back and pin back and accessorize with hair pins that perfectly match your wedding dress. This half up hairstyle covers is perfect for covering prominent ears. If you want something simple and stylist that effectively covers your ears then some very loose waves and light curling with a center part and the sides of your hair pinned back is a good option. This simple half up half down hairstyle is stylist and covers your ears.